Are you a cat owner in need of a break buying all that cat litter? Check out this free coupon for Dr Elsey’s Cat Attract Litter 20lb bag. This looks like an awesome coupon an I’m sure many cat owners would need. A coupon like this could probably be used at any authorized retailer of Dr Elsey’s products for any one (1) 20 lb. bag of Cat Attract or Kitten Attract. That’s a value of up to $17.00. I couldn’t see an expiry date, it could have been on the back. For those of you who are not familiar with what Cat Attract is, it’s for those stubborn cats who don’t like to use their own litter box. It has something in it that attracts them, and honestly, it does really work. I have this cat, who for the first 3 months would not use the litter box. I don’t know if it was because I used the same box for my other cat who had passed away, but she just wouldn’t use it for whatever reason. So, I found this Cat Attract and right away she used it. I used it for probably a month or two and then went back to the other generic litter and everything has been fine since. Great kitty invention, lol. Definitely an awesome coupon to get your hands on if you’re lucky enough. 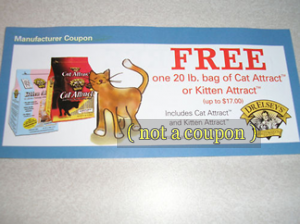 This free coupon for Dr Elsey’s Cat Attract Litter 20lb Bag would be for either the Cat or Kitten Attract. May need to pay sales tax depending on your state or province. This is exactly what I was looking for. I’ve heard some good things about this cat litter I hope it works for my 5 month old kitten who just does not want to use regular litter. I need to try a new kitty litter. This looks like a good brand. this is the only cat litter my kitten uses. My cat is super picky and I need to try something different!